Browse Our Online Asian Couture Shop For Our Exclusive Range Of Eliza Designer Dresses.We have in many beautiful colours, design and of finest materials. Aashirwad Creation semi stitched Off white & Pink Siffon Dress .100% original.Ladies Standard UK..
We are offering latest Salwar Kameez suits online in Uk. Karishma Kapoor designer Salwar Kameez Di..
KARISHMA KAPOOR ELIZA 5 HEAVY EMBROIDERED dressA Beautiful and hot Lehenga bas.. Designed for fashionable women, this Semi stitched Salwar suits will lend you a look worth fla..
Karishma Kapoor in Essenza-5 Printed Suit. Beauty and Elegance In digital Print Satin Georgette make.. 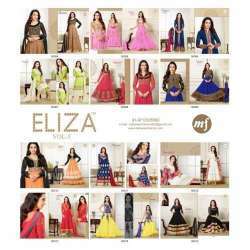 Beige and Fuscia Pink Elezita Salwar Designer Wear​​​​​​ in uk A collecton of 11..
Black and Gold Elezita Salwar Designer Wear​ in uk A collecton of 11 Beautiful d..
Cyan Elezita Salwar Designer Wear​ in uk A collecton of 11 Beautiful dresses Bas..
Fiesta Red Elezita Salwar Designer Wear in uk A collecton of 11 Beautiful dresse..
Fuscia Pink Elezita Salwar Designer Wear in uk A collecton of 11 Beautiful dress..
Green Elezita Salwar Designer Wear​​​​​​ in uk A collecton of 11 Beautiful dress..
Best look of a flower fairy by wearing this black georgette Karishma Kapoor style churidar designer..
M63002 Grey Maria B Style Salwar Kameez in UKA set of Straight dresses in Vibrant, Bright and E..
M63003 Orange Maria B Style Salwar Kameez in UKA set of Straight dresses in Vibrant, Bright and..
M63004 Purple Maria B Style Salwar Kameez in UKA set of Straight dresses in Vibrant, Bright and..
M63005 Black Maria B Style Salwar Kameez in UKA set of Straight dresses in Vibrant, Bright and ..
M63006 Yellow Green Maria B Style Salwar Kameez in UKA set of Straight dresses in Vibrant, Brig..
M63007 Purple Maria B Style Salwar Kameez in UKA set of Straight dresses in Vibrant, Bright and..
M63008 Grey Maria B Style Salwar Kameez in UKA set of Straight dresses in Vibrant, Bright and E..
M63009 Serenity Blue Maria B Style Salwar Kameez in UKA set of Straight dresses in Vibrant, Bright a..
M63010 Grey Maria B Style Salwar Kameez in UKA set of Straight dresses in Vibrant, Bright and E.. Fabric Inner:	SantoonFabric Dupatta:	Nazmeen ChiffonFabric Bottom:	Santoon Ladies Standard UK SizeSI..
Peach Net & Georgette AnarkaliBequeath a look of effortless sophistication adorned in this peach..
Orange Net & Georgette AnarkaliSurround yourself with endless compliments with this striking ora..
Black & Pink Net & Georgette AnarkaliGlitter like a star in the night sky by wearing this an..
Maroon Net & Georgette AnarkaliBreeze into any occasion like wedding, bridal and ceremonial with..
Blue & Pink Net & Georgette AnarkaliCreate a smashing impact on everyone by wearing this eth..
Black Net & Georgette AnarkaliBring an alluring glow to your face with this savory black georget..
Mint Elezita Salwar Designer Wear in uk A collecton of 11 Beautiful dresses Base.. Body : Soft Georgette WORK : Embroidery & Patched Work SALWAR & INNER : Crepe Silk DUPATT..